From L-R: 2018 Miss Indian Defense League of America (IDLA) Kari Hill, Cayuga Nation, Chief Ava Hill, Six Nations; Padre Norm Casey, Will Bouma MPP Brantford-Brant Riding and Marwood White, Master of Ceremonies. Ava Hill, Six Nations council chief, paid a tribute to all those local people who fought or were killed or injured in past wars. The Six Nations Veterans Association annual Remembrance parade and service featured a ceremonial fly by of Harvard World War II aircraft, a gun salute and passionate speakers. 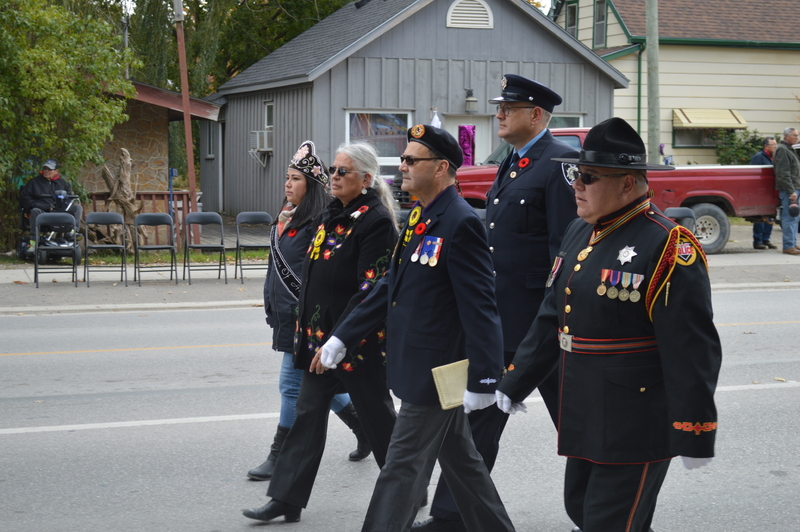 The event was accented by the parade amid the sounds of haunting bagpipes on Oct. 21 in Ohsweken, Six Nations. Ava Hill, Six Nations council chief, paid a tribute to all those local people who fought or were killed or injured in past wars. She provided condolences to the families of veterans Bob Johnson, John Bradley Jr and Gerald Hope, who passed this past year. “We were all saddened when Bob Johnson was taken by the Creator last December. He was a very active member of the Six Nations Veterans Association and acted as the Master of Ceremonies and was one of the main organizers for this ceremony as long as I can remember. He was also a member of our Six Nations Council and he continually advocated for our Six Nations veterans,” explained Hill. She continued to recall the strong voice and energy of veterans recently passed. “A couple of weeks ago we also lost a very good friend of mine, John Bradley Jr. Johnny and I were high school friends and I remember when he joined up with the army. We will miss Johnny for his service with the Six Nations Veterans Association and Royal Canadian Legion branch in Hagersville. “He took over reciting the ‘Act of Remembrance’ for us when his father John Senior passed and he also raised his strong voice to provide the honour roll for us. I just heard that we also recently lost Gerald Hope who was very active and supportive of our veterans’ association,” commented Hill. Master of Ceremonies for the event, Marwood White, introduced speakers who delivered passionate, supportive and enlightening words in remembering the sacrifices made by all the veterans. These speakers included Will Bouma, MPP Brantford-Brant Riding, and Lt. Col. Lawrence Hatfield, 56th Field Regiment of Brantford, who also represented Brantford-Brant MP Phil McColeman. Prayers were provided by Padre Norm Casey with the honour roll and Act of Remembrance read by Norma General-Lickers while anthems were sung by Sandra Hill-Bomberry. The Parade Marshall was John Charleau and Sergeant At Arms was Mike White. Last Post and American Tap was performed by bugler Martyn Cooper and the Silent Lament was piped by Jim Yates. The gun salute was staged by the 56th Field Artillery Regiment of Brantford and the parade was supported by the 163 Pipes and Drums of Hamilton. The fly by was performed by the Canadian Harvard Aircraft Association out of Tillsonburg. The Remembrance ceremony featured many laying of wreaths by families and community representatives in honour of the veterans.